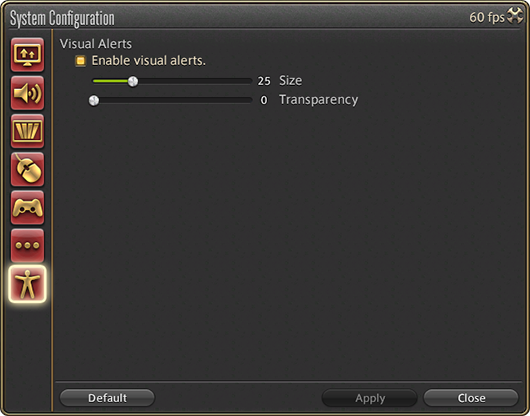 * As of patch 2.38, this option only affects chocobo raising cutscenes. * This setting has been rendered unnecessary due to changes in the functionality of item comparison. * Existing settings will not be changed. The new default settings will take effect should you choose to restore your settings to the default. - "Gathering Messages" changed to "Own Gathering Messages"
* This setting allows you to disable rear touch pad controls on your PlayStation®Vita when playing remotely. Note that this will render the L2, L3, R2, and R3 unusable, so consider your intended control scheme carefully before disabling. The following commands under the Chat tab can now be bound without using the Ctrl, Alt, or Shift keys. New entries have been added to the auto-translation dictionary. * The aforementioned text commands and mounts have also been added to the Text Command and Mount categories. The background music for Pharos Sirius has been adjusted. An issue wherein the aggro range for certain monsters was erroneously low. With this fix, monsters—particularly those found in instanced dungeons, trials, and raids—will have a greater aggro range than players have been accustomed to until now. 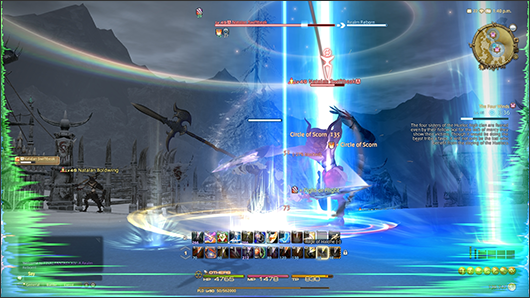 An issue wherein the initial cursor position for the Glamour interface while in gamepad mode was incorrect. An issue wherein players were able to select unrelated items for delivery in certain quests. An issue wherein cross hotbar commands would spill over the edge of the screen on lower resolution settings. An issue wherein messages from blacklisted players would be displayed in the log window while in certain dungeons. An issue where the running speeds of mounts were not consistent. An issue wherein certain pieces of equipment displayed incorrectly when using the /sit emote while fishing. *To resolve this issue, the seated fishing pose for Lalafell females has been altered. An issue with the Ixali beast tribe quests wherein the icon for the status Facility Access: Production II was incorrect. An issue wherein the items obtained from desynthesizing a pair of boarskin duckbills was incorrect. An issue wherein potential target highlights would display even when disabled. An issue with residential areas wherein the error message displayed when unable to execute the "Move to Front Gate" command did not display properly. An issue wherein emote adjustment did not function as intended. An issue in Frontline wherein PvP profile standings would not calculate properly for players who were offline at the time the campaign ended, then re-logged in while results were being displayed. An issue in Frontline wherein the slaying of a pet would erroneously count as a kill and yield five tactical rating points. An issue with housing wherein logging in under certain conditions would result in the loss of the player’s personal chambers. An issue with the Ixal daily quest “Larboard and Lodging” wherein the key item “large granite rock” could not be mined, rendering it impossible to progress further. An issue with the Ixal daily quest “Getting into Gear” wherein it was impossible to progress further under certain conditions. An issue wherein it was possible to stray off the edge of certain maps, making it impossible to progress further. An issue with the main scenario quest “Unsolved Mystery” wherein the quest was impossible to complete under certain conditions. An issue wherein opening the Company Profile window under certain conditions would make it impossible to progress further. An issue wherein attempting to sell items from the inventory window under certain conditions would make it impossible to progress further. An issue in Frontline wherein players attempting to enter a campaign already in progress would not be properly assigned to a party. An issue wherein opening a sphere scroll under certain conditions would make it impossible to progress further. An issue wherein performing repairs under certain conditions would make it impossible to progress further. An issue wherein attempting to desynthesize an item under certain conditions would make it impossible to progress further. An issue wherein switching tabs in the Character window would make it impossible to progress further. 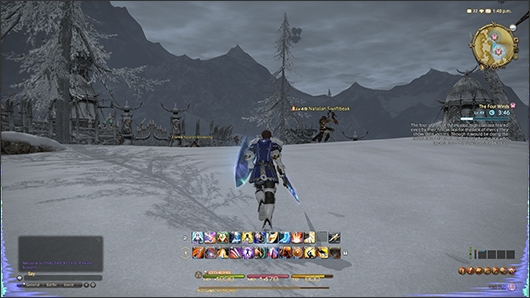 An issue wherein the animation for the item “Realm Reborn Red” did not display properly. An issue in Thornmarch (Hard) wherein it was impossible to progress further under certain conditions. An issue with the Praetorium wherein area-based damage-dealing sources would be carried over into the Ascian battle phase. An issue with Frontline wherein players were occasionally unable to ride pillion on a draught chocobo when in battle. An issue wherein it was impossible to infuse a relic weapon with materia under certain conditions. An issue with Hullbreaker Isle wherein the detrimental status "Dropsy" would not wear off under certain conditions. An issue wherein messages from blacklisted players would occasionally be displayed when in instanced dungeons. The following issues have been confirmed. An issue with “The Carteneau Flats: Borderland Ruins” wherein progress becomes impossible under certain circumstances. An issue wherein executing the “/mlcok” text command will make progress impossible under certain circumstances. *Regarding the above, restarting the client will correct the issue. An issue in the “SystemConfig” > “Movie/Cutscene Dialog Language Setting” wherein the setting for “Japanese” is displayed in Japanese. An issue wherein the animation for the start of the limit break “Skyshard” is incorrect. An issue wherein the log may not display properly when using the Master Goldsmith: Demimateria. An issue occurring after zoning to the residential district wherein a minion may not be displayed correctly. An issue in “The Second Coil of Bahamut (Savage) - Turn 4” wherein the Dalamud spawn may behave incorrectly. An issue in “Cutter’s Cry” wherein certain graphics are displayed incorrectly.